Salmon Portland Chase (January 13, 1808 � May 7, 1873) was a U.S. politician and jurist who served as the sixth Chief Justice of the United States. He also served as the 23rd Governor of Ohio, represented Ohio in the United States Senate, and served as the 25th United States Secretary of the Treasury. Chase is the 6th cousin, once removed to Thomas Lincoln, who is the husband of Nancy Hanks, the 8th cousin, 5 times removed to Edward Carleton, the husband of Ellen Newton, the stepdaughter of Danette Abney, my 6th great grand uncle. 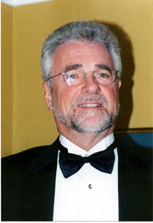 Born in Cornish, New Hampshire, Chase studied law under Attorney General William Wirt before establishing a legal practice in Cincinnati. He became an anti-slavery activist and frequently defended fugitive slaves in court. Chase left the Whig Party in 1841 to become the leader of Ohio's Liberty Party. In 1848, he helped establish the Free Soil Party and recruited former President Martin Van Buren to serve as the party's presidential nominee. Chase won election to the Senate the following year, and he opposed the Compromise of 1850 and the Kansas�Nebraska Act. In the aftermath of the Kansas�Nebraska Act, Chase helped establish the Republican Party, which opposed the extension of slavery into the territories. After leaving the Senate, Chase served as the Governor of Ohio from 1856 to 1860. Chase was a U.S. senator, governor of Ohio and Supreme Court chief justice who served as the U.S. secretary of the Treasury during the Civil War (1861-65). A staunch abolitionist, Chase spent his early career as a lawyer, and became known as �the attorney general for fugitive slaves� for his frequent defenses of runaway blacks. 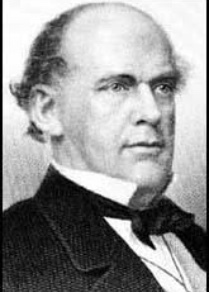 After representing Ohio in the U.S. Senate from 1849 to 1855, Chase went on to serve as the state�s governor from 1855 to 1859. He made a failed bid for the Republican presidential nomination in 1860 before serving as Abraham Lincoln�s secretary of the Treasury. Lincoln had been the winner for the Republican Party nomination. Chase was responsible for managing the finances of the Union during the Civil War, and was instrumental in establishing the national banking system and issuing paper currency. Chase resigned his position in June 1864, and was appointed chief justice of the U.S. Supreme Court later that year. He would serve until his death in 1873 at the age of 65. Lincoln nominated Chase to fill the Supreme Court vacancy that arose following Chief Justice Roger Taney's death. 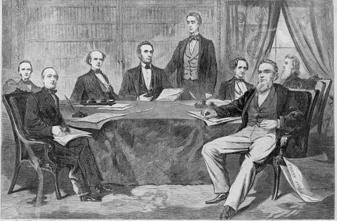 This is President Lincoln�s Cabinet in his first year of the Presidency. Chase is seated immediately to the left of President Lincoln, as we view the scene. Others were Postmaster General Montgomery Blair, Interior Secretary Caleb Smith, etc. It can be of note to notice that Abraham Lincoln and Salmon Chase were 7th cousins to each other. So, politically speaking, we can say the Theory of Relatively was working. However, it could be that both gentlemen were unaware of their connection. Chase served as Chief Justice of the Supreme Court from 1864 to his death in 1873. He presided over the Senate trial of President Andrew Johnson during the impeachment proceedings of 1868. Despite his service on the court, Chase continued to pursue the presidency. He unsuccessfully sought the Democratic presidential nomination in 1868 and the Liberal Republican nomination in 1872. Salmon Portland Chase became the namesake of the Chase National Bank founded in 1877. Chase National Bank was formed in 1877 by John Thompson. 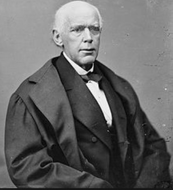 It was named after former United States Treasury Secretary and Chief Justice Salmon P. Chase, although Chase did not have a connection with the bank. That bank experienced several mergers and combinations over the years to emerge today as the Chase National Bank, the largest banking system in America in terms of assets and deposits. In 2017, it was the 6th largest bank in the world, with the larger five all being Asian banks. Here is Chapter 61 in my autobiography which details these mergers and the other leaders significant in those activities, such as the Rockefeller family, etc. One other interesting facet about Salmon Chase is his image being displayed on the $10,000 dollar bill! There were 12 denominations of currency created by the U.S. Government, but this is one of the five no longer being printed: $500, $1,000, $10,000 and the $100,000. A few of these are out in the �public� in the hands of collectors, for the most part.